Unless you’ve been on vacation somewhere warm (I’m jealous) you have likely been hiding in from the cold. I don’t mind the snow and the seasonal changes but when that wind chill is factored in it gets bloody cold. These are the days I start dreaming about being able to put on my shorts and t-shirt although I’m getting used to what is now my home, Canada. I was reading an article about the coldest jobs in Canada and wondered how people get used to these frigid temperatures especially those in Yellowknife where temperatures near arctic levels. I have to commend those that work in these cold temperatures such as carpenters, road side assistants, fire fighters, ambulance, police and so on. It got me thinking about all the people who do have to work outdoors and what they have to endure on a daily basis. How lucky are we that get to stay indoors where the temperature is toasty warm and for some they can slip off their shoes and put on cozy slippers whilst sipping a latte. Very lucky so next time we catch ourselves complaining about our job remember all the people who have it worse off than us. What’s the coldest job you’ve ever had? Speaking of coming in from the cold and into the warmth for now is Rob Ford who received the green light today winning his appeal back into office as Mayor of Toronto after his donation scandal appeal. Should he get the boot for improperly participating in a debate about how he raised money donations for his football foundation using his influence as councillor on city hall letterhead? Funny how they say that when money is involved some people will do just about anything or say just about anything to get what they have to get. Should we forgive and accept his error in judgement and move on or lay down the law because he knew what he was doing was wrong? Sometimes the decisions we make in life even if we think they are a simple error might come back to haunt us. Be careful what you wish for and always ask yourself if it is the ethical thing to do because you might just find yourself standing out in the cold. The Sandwich Generation, what the heck is that? No it’s not the kids who hang out at Burger King, McDonald’s, Wendy’s or Harvey’s on a Friday night, it’s far from it. If you’re taking care of your own back, caring for your children and having to care for your parents you are part of the sandwich generation. This is what I learned and to be honest we should listen up. We don’t have any kids yet but we really didn’t give much thought to our parents and who will care for them or if they need any care at all. Heck my parents are half way across the world. Is that our job as children to help our parents when they get older? In my heart of hearts I’m going to say yes for me. My parents did everything for me growing up and if I have to carry them to the finish line, you can bet I’ll be there with open arms. How do I prepare for this potential squeeze and how would it affect our own retirement goals? Many people are asking themselves these questions because they are helping family when they can. A poll from RBC states that 26% of Canadians will rely on an employer pension in retirement yet 1 in 5 have a defined benefit plan. Best of it is, almost 3 quarters of the people they polled don’t have either. Times are going to be rough going if we don’t take control of our finances and make a plan. 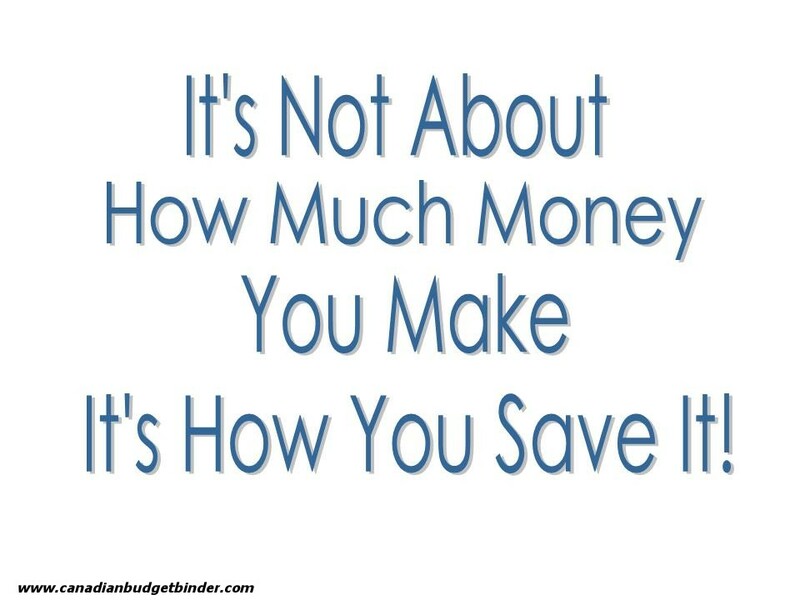 Budgeting is only one part of personal finance the rest is planning. We plan to budget and plan to plan for the future because we don’t want to wait around for it to finalize plans for us. What’s your plan? 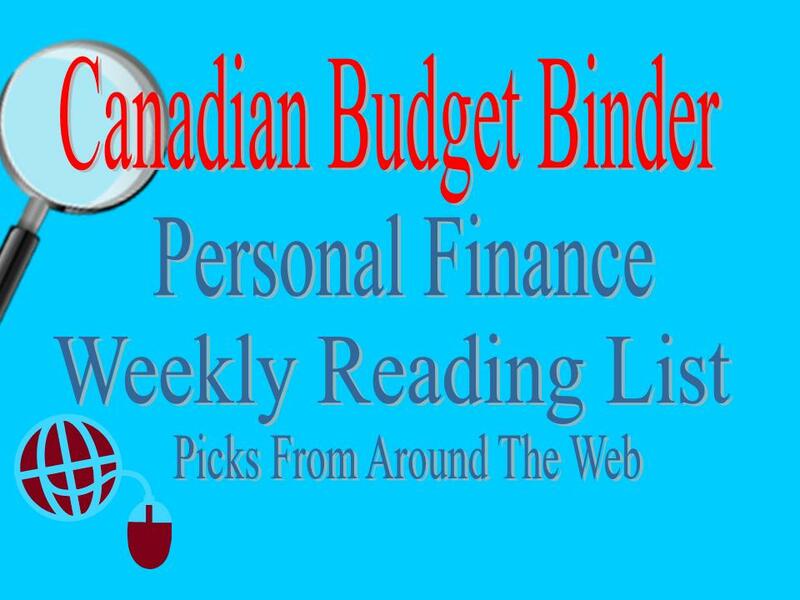 Thanks for your continued support of Canadian Budget Binder and now I’ll share you with my fans. Reach Financial Independence- 13 Money Resolutions for 2013- Give Back! Living Debt Free Rocks– What Is Your Debt Holding You Back From Doing? Savings Advice– Is Brand Loyalty Costing You Money? The Frugal Girl–How Much Stuff Should You Own? Master The Art Of Saving– Why Didn’t I Get A Pre-Paid Cell Phone Sooner? Edward Antrobus- Do You Have What It Takes To Be A Paper Boy? My Money Design- What is Financial Freedom? Femme Frugality- What Would You Do With All The Money In The World? Tweet Tweet… Goes my Twitter Followers! There have been so many awesome people who have tweeted my posts on Twitter this week. Since there are so many it’s easier to say thanks to all of you at once, so thanks! Great list as always, Mr CBB. Looking forward to reading my way through it over the weekend. As always, thank you so much for the mention. Have fun reading Beth, some pretty awesome articles this week, hence the bigger list. Cheers mate. Okay so the sandwich thing scared me as I know it’ll probably eventually become my reality. (Luckily I have siblings so maybe it will at least be a shared reality.) But then I got distracted by the chocolate goodness in the next post and the whole world seemed right again. Thanks so so much for the mention! Thanks for the mention. I’m with you. My parents cared for me when I wasn’t able to care for myself. It’s my duty to do the same when the tables are switched. You’re parents must be proud they raised a man like you Edward. Sometimes we tend to forget as we age they are aging too. Life is too short when it comes to our parents. First off I think my hubby has one of the coldest jobs in Canada….he works at a frozen food distribution warehouse. He works in minus 45 degree C weather everyday, Mon to Fri, 47 weeks a year (5 weeks holidays) plus overtime, 8 hours a day. That’s colder than it has been outside all week 🙂 I used to laugh at him when he whined about it but I did a tour of his work in the fall and I couldn’t believe how flipping cold it was in there! I was surprised that Ford got to stay. He probably just made another ‘donation’… Thanks for the mention. Thanks for the shout-out as always, CBB!! Thanks for the link love dude… I am with you on the helping parents front. I will be there to build a granny flat and give them the best possible care if they need it. Also glad that I don’t have to work outside and bare the elements!! I can see us taking care of my in laws as they get older. Not looking forward to it, but you owe them that. Thanks for the mention. Thanks so much for including me!! I hope you have a great weekend! I hear you on the sandwich generation…. I’m smack in the middle of that one!!! My Dad is 81,Mom died in 2005. My in-laws are both gone, Dad in 1991, Mom in 2000. Three kids and a grandson. My Dad’s brother is alone, never married, so I try to keep track of him too, usually through Dad. I had both of them here at Christmas…. it’s the only time I can get them here…..I’m about 20 minutes away by car if need be.I worry…… I help as much as they will let me…. So far they are both independent. Dad is usually the one that my uncle calls for a ride. Mind you if it meant going out of town I’d hear about it as Dad doesn’t drive out of town or at night…..
Amazing how the tables turn as we get older. It’s great they have someone around like you Christine. Interesting thought! I will probably be part of that generation at some point, but I’m with you, my parents took care of me, and taking care of them is just part of the deal. Now, I’m hoping to help get them on a budget and set them up for life, but sometimes (read: most of the time) my advice falls on deaf ears. I find that when it’s people you know like family it will fall on deaf ears, same here. My husband and I are definitely part of the sandwich generation and are already feeling the effects. We support the growth and education of our son (my stepson) while we have elderly parents who do need financial assistance, especially my M.I.L. We knew this was coming so we began to prepare for it a couple of years ago. It also reminds us daily that we want to be nowhere near in her bleak financial position when we are seniors! Thanks for the mention and enjoy your week-end. Nice one but I actually touched a little upon the topic in an older post called Unconventionalism in Action. We realized that she was getting weaker physically and couldn’t work to support herself as much. Her social security cheque isn’t enough so we established that she will likley need to live with us in the home that we’ll purchase (make a M.I.L. apartment) if she cannot find a cheaper rental. It’s either that or she wins the lottery…and she doesn’t play. Hubby and I each only have one remaining parent left. My MIL is 92 and my father is 82 but we are very fortunate they both have clear minds and only age related physical impairments. Larry’s sister lives a block from his mother and since they are both single gals, they see each other pretty much every day. My SIL has picked up the slack on running her mother around now that she no longer drives. Fortunately my father has a wife that’s 25 years younger than he is… and she’s shouldering his age related issues. Thanks much for the mention as always Mr. CBB. It’s been cold here as well, below -0 several days this week. We’ll probably, though I hope not, be a part of the sandwich generation ourselves…not a good thing when family is spread all over the country. True, it can be difficult. I’m lucky that my parents are ok financially and I won’t have to worry about them but if I did I would be right there for them. I like the saying: There is no such thing as cold weather, only improper clothing! Although I hate the cold, it is easier to stand with good protection. Enjoying the sun for you 🙂 Have a nice weekend, thanks for the mention! But I honestly wouldn’t have it any other way! I thought you might like this as I thought about you as I wrote it. They must be proud to have children like you. Cheers Vic! The sandwich generation, I like that. I’ve spoken to lot of people in the past who thought they we’re set up financially only to be undone by a dodgy mortgage endowment, pension or equity release scheme. I think we do have a responsibility to make sure our parents are financially secure, after all most estimates say my parents spent almost a quarter of a million pounds raising me! Exactly my point and all money aside, it’s more about love and blood… we have to look out for our own regardless of investments gone wrong, money problems etc. I couldn’t watch my parents living on the street knowing I could help. Northerners read our blog too?? Ha that’s great. Actually, some of the inspiration for my relationship posts have been from a girl I dated from Toronto. Anyhow, thanks for the inclusion!! Believe it or not mate some of my busiest posts are about relationships. What men want in a woman, What women want in men, dating advice… I’m starting to think I’m going to start a new blog.. Ask Mr.CBB the Love Doctor… Cheers mate! I have never heard of the sandwich generation, but I can see it now. I don’t know if anyone wants to be called a sandwich. Thanks for the mention Mr. CBB! I hope you have a wonderful weekend. Well how about a wrap or a fajita… or a casa Roll EH!!! lol… I understand what they are going on about and it’s true I hear it happening and even some of my fans are having to help out their parents and children. I don’t have any kids, but I often wonder about my parents who live across the country. Actually my biggest worry is when and if something happens to my parents, my older, useless brother will probably start hounding me to help me and give him money (which will be an absolute no). Long story. Family is complicated! I was thinking of taking 2-3 weeks this summer (since I can do that with freelancing and it’s usually very slow that time of year) and spending it in Detroit with my parents so I really get in some good quality time with them. Since I’m probably not going to be playing beach volleyball this summer, it’s more doable. I could probably even rent out my place for a month to make some extra money. They are getting older, and I don’t want to regret not having spent some time with them before it’s too late. wow this was long-winded. 🙂 Thanks for the mention as well. Funny how we always talk about ourselves getting older and forget about how much older our parents are getting. There’s no turning back when they are gone.